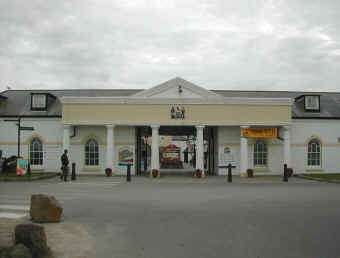 Penzance is at the far end of the A30, the main route into Cornwall for thousands of visitors each year. It is also the end of the line for the railway from London and it is also very near to Land's End - which aptly describes the situation as the Cornish peninsular narrows rapidly to disappear into the foaming Atlantic Ocean. Marazion is the shore base for access to St. Michael's Mount. Penzance is well known as a seaside resort and is popular with thousands of visitors who return year after year. It has a laid-back feel about and is an ideal place to relax and forget the rat-race. Although it has not always been this peaceful. In 1565 it was on the front line in the war with Spain when it was attacked and mostly burnt down. Charles II granted Penzance the right to make coins in 1663 and this boosted the mining activity in the area. 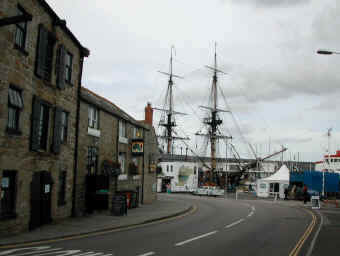 After this the town continued to prosper as a market town and its port became increasingly important for trade with Europe. Recent years have seen the town become a popular location for artists and develop into a very popular tourist resort. 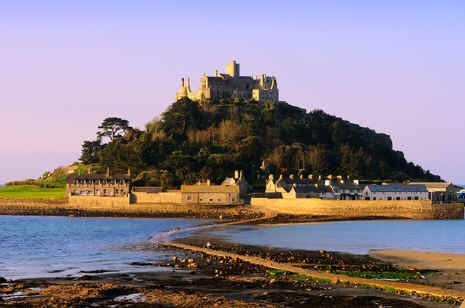 The village of Marazion overlooks Mounts Bay and is the access point for St Michael's Mount. This priory was built by the same order of monks which built Mont St Michel off of the Normandy coast during the 11th century. The priory which is now owned by the St Aubyn family is cut off by the sea at high tide but can be reached on foot at other times via a cobbled causeway. The main house is managed by the National Trust and is open to the public for a charge. You can walk to the island at low tide for free and visit the grounds and harbour and a small ferry operates at high tide. Beware that the tide moves very fast and covers the causeway! Helston, Sennen Cove and Mousehole which are all worth a visit.